Seven Seas Mariner is the world's first all-suite, all-balcony ship, therefore offering undeniable luxury, comfort, and of course stunning views. Catering to only 700 guests, she is one of the most spacious cruise ships afloat, and her 450-strong crew means they can provide a guest-to-staff ratio of 1 to 1.6. 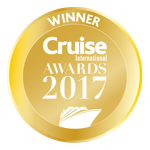 This means they can offer the highest level of personal service to the most discerning of travellers; as is the tradition in the six-star Regent Seven Seas Cruises. Onboard Seven Seas Mariner, the luxury experience is made even more rewarding when you dine in any of the four gourmet restaurants, which are all included in the cost of the fare. Otherwise enjoy superb anytime dining in any of the other exquisite open seated restaurants, simply request a table and you will be seated promptly. Pre-dinner, you will find Horizon Lounge the perfect place to relax and unwind, during tea-time the in-house residents entertain daily. After dinner, the Star's Lounge is the place to go with friends for tantalising cocktails and to dance the night away. Fun is always the priority in the casino, where you can try your luck at roulette, black jack and other table games. For an extended night cap, turn to Observation Lounge for a starry evening or visit the Connoisseur Club for an extensive selection of fine cigars. The Constellation Theater provides entertainment on a larger scale in upmost comfort; revel in Regent Sevens Seas' truely spectacular circus productions and rowsing caberets. Relax in the Canyon Ranch SpaClub, which is one of only a handful in the world and indulge in therapies that restore, relax and rejuvenate mind, body and spirit. Treat yourself to a new look in the salon or have one of the indulgent beauty services on offer. If you're looking to get a little more active, join an energising class in the fully-equipped fitness centre. Onboard Seven Seas Mariner, can enjoy that ideal day, every day. The Pool Deck is the centre of open-air recreation and relaxation. Ease into the heated resort-style pool or inviting whirlpool. Throughout your voyage, attend a complimentary enriching lecture or learn from a true gourmand the art of wine and food pairing. Seat yourself on one of the plush chairs in the library and enjoy a classic novel, or take your pick from a selection of DVDs and board games available. How does a card tournament sound? See what's happening in the Card & Conference room. To keep you going throughout the day, why not try one of the speciality coffees and teas made by trained baristas in Coffee Connection, complimented with freshly baked cakes and pastries.